3D Printing is more ancient than you think. It may seem a fairly new technology but it is not. The birth of 3D printing can be traced back to late 1970s when the first inkjet printer was manufactured. The technology grabbed Eye-balls and Ears, but nothing substantial could be done in the following half-decade. However, in 1981, when Hideo Kodama of Nagoya Municipal Industrial Research Institute published a paper on Rapid Prototyping (RP) system – he imagined a system of printing layers of a model on a platform and building layer above layer to form the final product. He was to subsequently file for a patent but somehow the poor guy could not do so we still could not find any significant breakthrough in this technology. The RP system was in itself a great ideological breakthrough but with no practical use. The end piece of the jigsaw puzzle was still eluding many researchers. And finally, a breakthrough was achieved after three years. Approximately three years later, Hideo Kodama published his paper, in 1984, Charles Hull, an American Engineer, invented Stereolithography Apparatus (SLA). He patented the technology in 1984 itself. 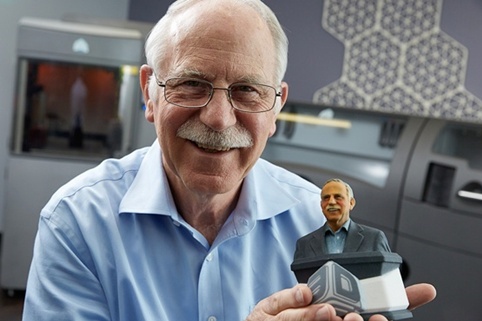 Charles Hull went on to become the Co-Founder of 3D Systems, which is now one of the largest 3D printing organizations. Stereolithography is a technique which lets designers manufacture a product from a 3D model created in any modeling software. So, in short, the digital model could now be converted into an actual, tangible product. The laser source flashes a Laser beam to solidify the semi-liquid Photopolymer resins. The Laser beam moves in X-Y axis across the surface of the resin. It moves across as per the 3D design of the model from the software. Once a layer of the resin is solidified, the elevator moves down lowering the Vat in the Z direction and now the laser traces the next layer. This process continues until the product is completely traced out. The elevator is now moved up to remove the product from the Vat. In lay man’s language, we can say that the process is used to basically to slice a product into numerous layers and place those thin slices one over the other to form the final product. The 3D product is created as the layers are formed one above the other. Due to the complex nature of the process, the products sometimes need support structures. These are mainly required for products with undercuts or overhangs. Like every process, this process too requires post-processing for removing the support structures and smoothening the walls. But comparatively the processing is far too less in Stereolithography. Stereolithography was the first 3D printing method which paved the way for the technology to grow and prosper. Although the technology was patented in 1984, it took another 6-8 years to build the first 3D Printer. In 1992, 3D Systems actually built an SLA Machine to present it to the world and let them see the power of 3D printing. By the same time, a start-up, DTM Corp invented the world’s first Selective Laser Sintering (SLS) Machine. These machines were charting unexplored frontiers but still, a lot of years of research had to be put in it to make it commercially viable. These machines were slow to operate and still required some amount of manual intervention. The research went on until the 2000s. Almost 20 years had passed since the first paper was published and technology was patented but still, the technology was in its infancy. This was the time for the technology to grow and showcase its true potential. In 2000, a new breakthrough was achieved. First 3D printed organ was implanted in a human body. The scientists at the Wake Forest Institute for Regenerative Medicine, 3D-printed the synthetic building blocks of human bladders. This newly generated tissue was then implanted in the human body. This was the decade when the Bio-Printing took center stage and came up with exciting and prospective inventions. Scientists were eager to understand more and more about the technology and use it in the medical field due to its main feature of customization. This was a golden period in the development of 3D printing in the medical application. Many start-ups started creating medical applications like printing a functional miniature kidney, building prosthetic limbs and other complex parts. Scientists even bio-printed the first blood vessels. In 2005, the open-source movement took over and Dr. Adrian Bowyer’s RepRap Project launched an open-source initiative to manufacture a 3D Printer which could print many basic products. Its 2008 upgrade was a self-replicating printer. Suddenly, people everywhere had access to printers and they could print tangible products from just their ideas. The research was still going on and, in 2006; the first commercially viable SLS printer was manufactured and received widespread acceptance and demand from industries. The creative innovations were effectively clubbed together by Shapeways, which was a marketplace where designers could display their designs and receive feedback on the same. Another company emerged in this technology boosting environment, MakerBot. They provided Do-It-Yourself open-source printers. This was the time when even regular designers could afford the 3D Printers to test their designs. The Entry barrier was breached and designers everywhere could now get their hands on this technology. As the days are passing by, the advances in 3D Printing are only following an upward trend and will continue to do so for the coming decade. 3D printers are available at most affordable rates and the accuracy is getting better with each iteration. This will continue year on year. The applications have crossed all limits which Charles Hull might have dreamt about. From plastic products to body organs, from automobile to aerospace, from manufacturing to jewelry and to the latest being Food Printing. We have also heard of 3D printed offices and 3D Printed cars and aircrafts. 2008: For the first time a fully functional 3D printed prosthetic leg is with a socket, foot, knee, etc. 2015: Google acquires Carbon3D, a 3D printer manufacturer which uses a Continuous Liquid Interface Production (CLIP) process. 2016: Local Motors manufactures OLLIE, a self-driving 3D Printed minibus. The Minibus is controlled by IBM Watson that talks to the customer.